High Quality, Self Serve, Self Cooled ‘Dispensers’ holding up to 3 litres. As seen in 789 Venues throughout Australia. 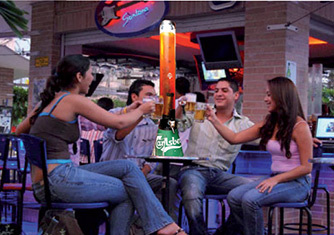 New to Australia ... Aussie Beer Tubes are the coolest Drink Dispensers to hit our shores! Guests simply help themselves. Easy to Pour, Easy to Clean and Fun to Use! And your friends will think they are cool! A Self Serve, Self Cooled, stand alone Drink Dispenser... holding up to 3 litres of your favorite Beverage. Made of Polycarbonate fibre they are Strong, Safe and Secure. The polycarbonate insulates the beverage, whilst Chill Sticks keep beverages chilled for up to 4 hours. An Internal light makes them glow at night. Personalise them with your Name, Business, Logo, Sporting Team or for a Special Occasion. Fill with Beer, Wine, Cider, Champagne, Mixed Drinks or Cocktails. Perfect for Beer and ideal for all cocktails – Daiquiri's, Sangria, Illusions, Cosmo's, Margarita's, Pina Colada’s, etc. Aussie Beer and Party Tubes are Ideal for all Parties – Birthday’s, Christmas, Engagements, Weddings, 21sts, 18th's, Kids Parties, Sporting Events and Family Occasions. Aussie Beer Tubes is a wholly Australian owned company. © 2019 Aussie Beer Tubes. All rights reserved.